Time for a new storyline. Shift, by Redbrick, is a productivity application with a simple goal: to make navigating between multiple Gmail accounts faster, easier, and more efficient. With Shift, all of your accounts live within one desktop application. 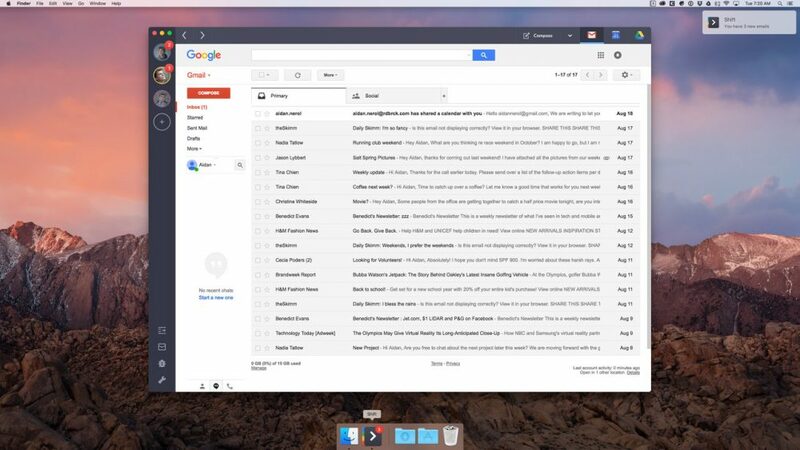 You can seamlessly transition between Mail, Drive, Calendar, for multiple accounts. Behold – simple, streamlined and intuitive navigation that allows you to work faster and accomplish more. The winning design of Shift is indicative of the creativity that has powered Redbrick into becoming 5th fastest-growing business in Canada and 2nd fastest-growing Canadian software company, as ranked in the 28th annual PROFIT 500. Redbrick commands an ever-growing portfolio of B2B offerings focused on user engagement and solution-driven technology. Shift is available as both a free and a Pro version for a yearly subscription of $19.99. The basic plan offers customers access to two accounts; a sleek, clutter-free desktop application; easy switching between Mail, Calendar, and Drive; native desktop notifications; and cross-platform support for Windows, Mac, and Linux. Pro plan upgrades include access to an unlimited number of inbox accounts and support for additional email providers like Outlook, as well as removal of the “Sent with Shift” signature. Currently, the company is offering 30 days of Shift Pro free of charge. Ready to get Shift done? Preview features and learn more about the application at tryshift.com.